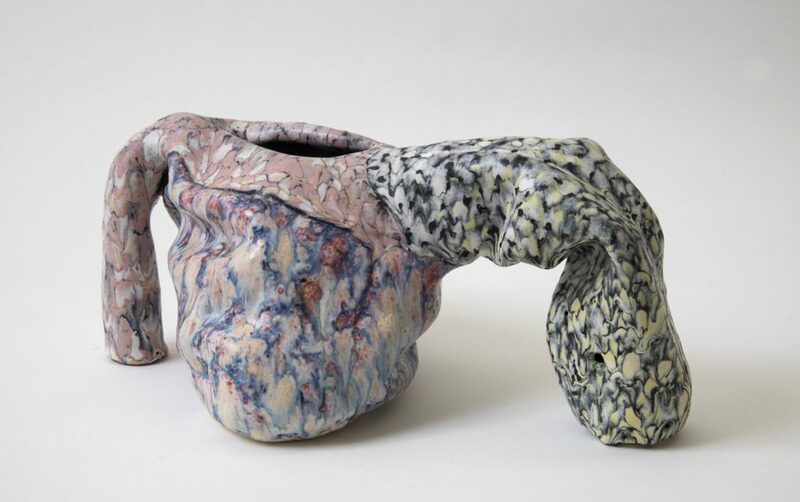 Elisa D’Arrigo‘s upcoming exhibition, “In the Moment,” at Elizabeth Harris Gallery will feature her new body of ceramic work. Her vessel forms breathe with inner life, their cylindrical shapes are both tumultuous and vivacious – like a body, organism, or life itself. The artist shares with Art Spiel some of her thought and work processes as well as some insight on her upcoming show. AS: Tell me about the body of work for your upcoming show, “In the Moment” at Elizabeth Harris Gallery. 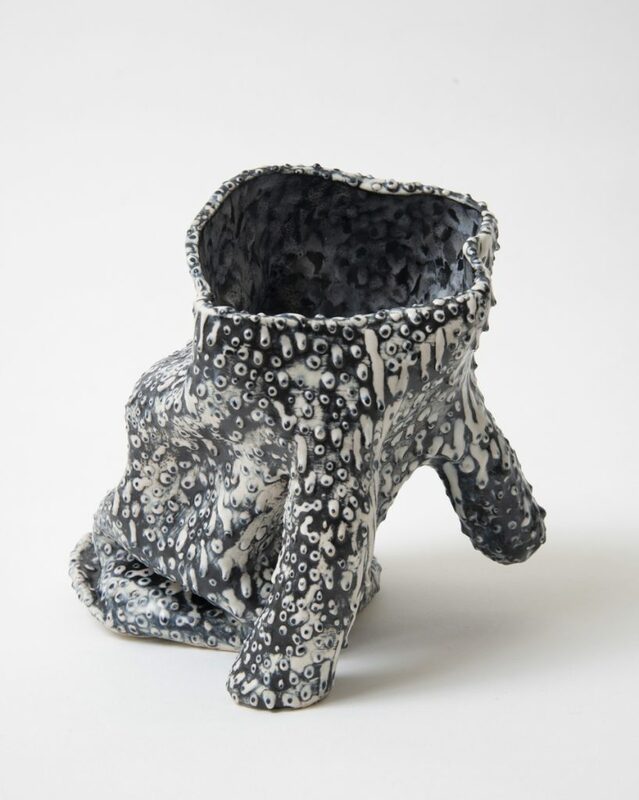 Elisa D’Arrigo: In this body of work I conflate painting, drawing and animated form within the context of the glazed ceramic vessel. The pieces begin as variously sized hollow and hand-built cylindrical forms that I manipulate and combine while wet, in a period of intense improvisation. The “postures” that result allude to the body in a gestural and even visceral manner and exude a figural presence. Their hollowness evokes the notion of interiority, and animation from within. My penchant for improvisation yields freestyle forms that feel surprising, but also oddly familiar. I relish the intrinsic humor that is generated by unexpected asymmetries. While the forms themselves are created relatively quickly, the glazing can take months, as I re-glaze and re-work, until I arrive at a result that clicks with the form in some way. My intent is to project a physicality that also embodies states of mind. I am compelled by the way we inhabit and imagine our bodies from the inside out, and by the psychological and corporeal aspects of containment. The inside creates the outside, and vice versa. That is central in this work. AS: Can you share how you got to be an artist? Elisa D’Arrigo: As a child, I constantly drew and made things – and never stopped. Growing up in the Bronx in the 1950’s, as a first-generation Sicilian-American, there was a pervasive do-it-yourself, but also express-yourself atmosphere. Before emigrating, my grandfather was a shoemaker who tanned his own leather and my grandmother was an expert embroiderer and the only butcher in town. My mother was a self-trained painter and reviver of forgotten recipes. My father liked to say he learned English on the dance floor of the Roseland Ballroom – he was a superb dancer and also a cook, insisting on making his own salami. Our backyard had fig trees which were wrapped with blankets and tied with rope each winter, resembling twisted and somewhat grotesque, looming abstract figures. I found those fig trees, and the prevailing 1950s Bronx visual culture of curvaceous cars, brash comics, and extreme hairstyles, endlessly fascinating. I remember a lot of collective excitement about those visuals. I considered all that on a par with the art I saw at the Met, the Cloisters, or the Museum of Primitive Art (now the Rockefeller collection at the Met). My parents loved art, and took my sister and me to those museums, but contemporary art (as well as MOMA or the Whitney) was not on the radar and I did not realize there were living artists. Art was something I did all the time and looked at a lot but never put together as something one could do with one’s life. I had minimal art instruction at school, so I started drawing what was around me: animals at the Bronx Zoo, trees in the Botanical Gardens, and Greek and Roman sculptures at the Met. I coerced family and friends to sit for me, and did self-portraits. I copied master drawings. I was especially captivated by how light defines three-dimensional form and felt driven to depict that. I made sculpture from what was at hand, influenced by the work at the Museum of Primitive Art. My grandmother’s needlework inspired me to learn traditional embroidery stitches, and I found drawing with thread, as I thought of it, especially appealing. I was strongly attracted to art that also functioned – such as reliquaries, fountains, vessels, devotional objects. Creating a beehive hairdo seemed like a legitimate expressive endeavor. Maybe that’s why I’ve never understood the craft versus art divide. I planned on studying biology in college, until I realized what I most loved about the subject was drawing the things I observed under the microscope but was deeply bored by any required measuring or precision (not the best trait for a scientist). On impulse, I applied to SUNY New Paltz, which I heard had a good ceramics department. I yearned to do ceramics since age 7. My ceramic professors there, (Kenneth Green and Robert Sedestrom), imparted invaluable technical information as well as meaningful ways of thinking about form. But I was not in sync with required lessons about production pottery, and I literally “glazed over” during an assignment to design and replicate an object 50 times. That class cemented my stance to never again make anything even twice. After receiving a BFA in ceramics in 1975, I moved to NYC and have been here ever since. I worked in clay until about 1981, then gradually segued out of ceramics, producing work that I realize in retrospect incorporated various craft processes, using materials such as paper, paper-maché, cloth, thread, wire, wood, Styrofoam, wax, paint and clay (both unfired and fired). The resultant abstract forms, which were wrapped, carved, torqued, woven, sewn, or accreted, conveyed my fascination with the innate psychological qualities of those processes. AS: I have recently seen your earlier wall relief at Gallery PS122. Is there a transition from wall reliefs to free standing sculptural forms or have you developed them simultaneously? Elisa D’Arrigo: The wall piece you saw, “Recollection…drawing” 2007, was one in a series of hand-sewn cloth sculptures, some of which were in fact freestanding. I evolved that body of work over nearly 20 years. 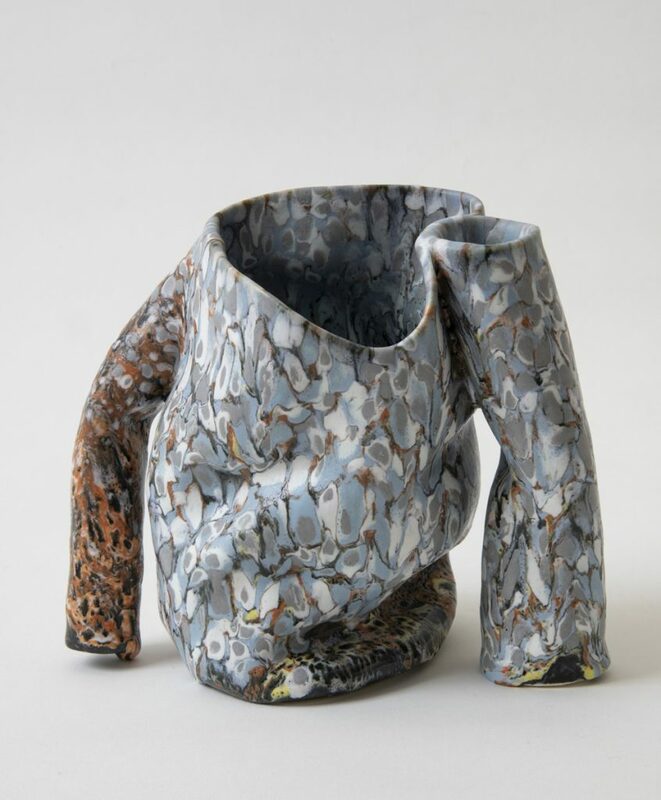 There was a transition back to ceramics in 2010, and the ceramic piece you saw at PS122, “Googler 2,” dates from 2018. 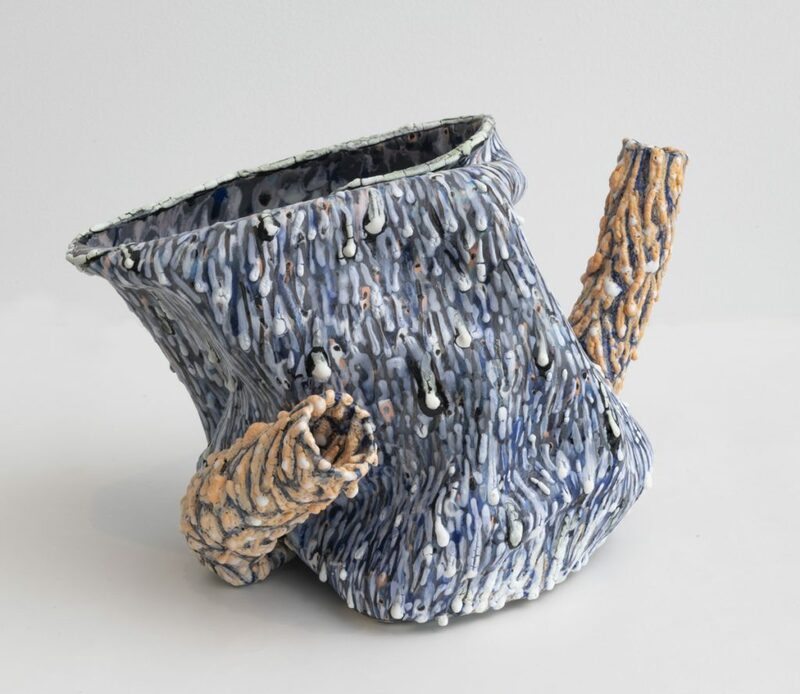 The ceramics and cloth work were not developed at the same time or worked on simultaneously- I generally focus intensively on one way of working at a time. I began using cloth in the 1980s as a supporting layer over Styrofoam or wire armatures, and under paper-maché, unfired clay, wax, or acrylic mediums – sometimes all of those combined, making both free-standing, on the wall, or work that extended from wall to floor. Over time, I gradually did away with the understructures and surfaces, and began working with cloth alone, which I stiffened and stained with acrylic mediums, paints, and pigments. I eventually began repurposing my family’s used clothing; a move which added subtle references to the body and personal history. I realized sewing was the best way to attach things made of cloth, opening up a world of expressive possibilities connected to embroidery I’d done as a child. From the 1990s until 2010, desiring a flexible tactility for the work, I constructed pieces by hand-sewing flat or hollow elements (many, sometimes hundreds), formed entirely from layers of cloth or paper. These densely stitched, undulating forms have no understructure and are held together by thread alone. Seams define contours; stitches create lines, marks and surface. Each piece unfolded differently depending upon chance and whim. 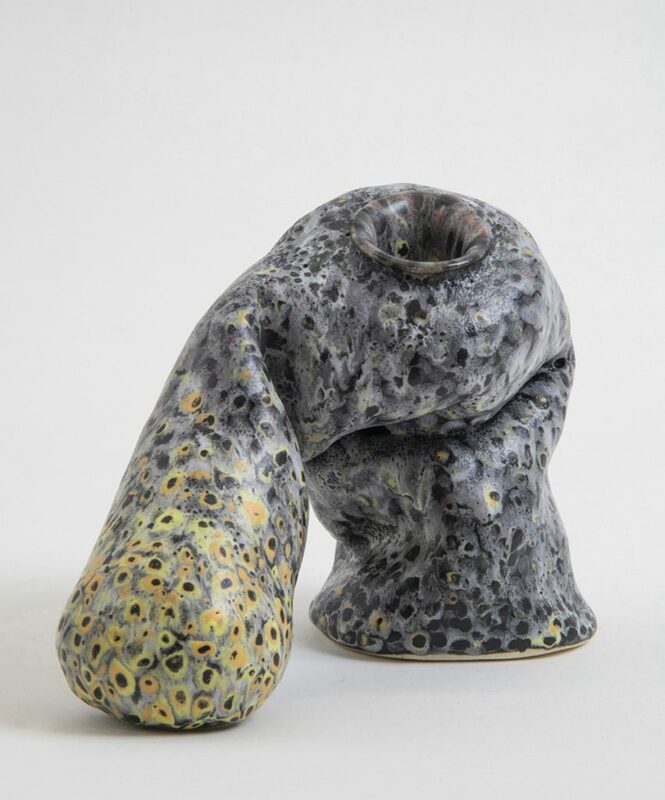 Categories – sculpture, drawing, and painting were dissolved, recalling my earliest ceramics from the 1970s, a medium in which these categories are already conflated. 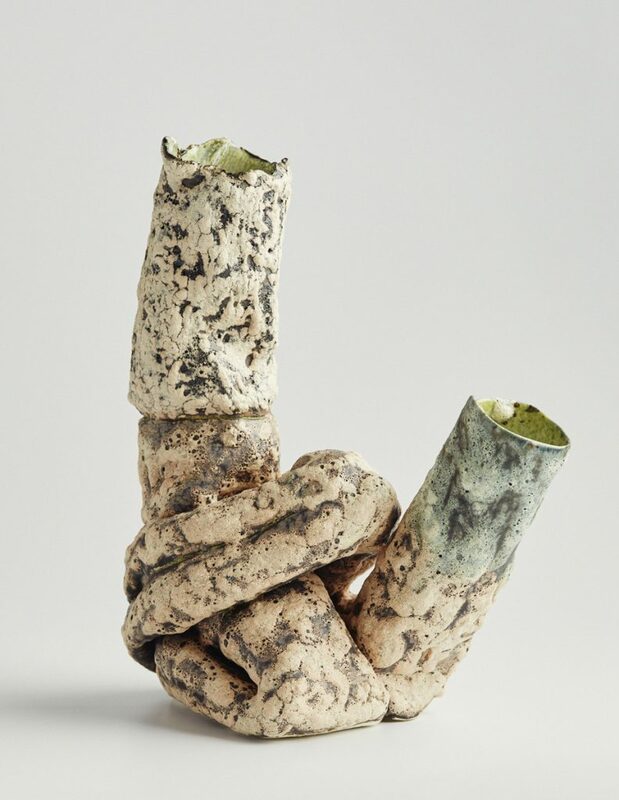 It’s what first attracted me to ceramics, and what intrigues me still. 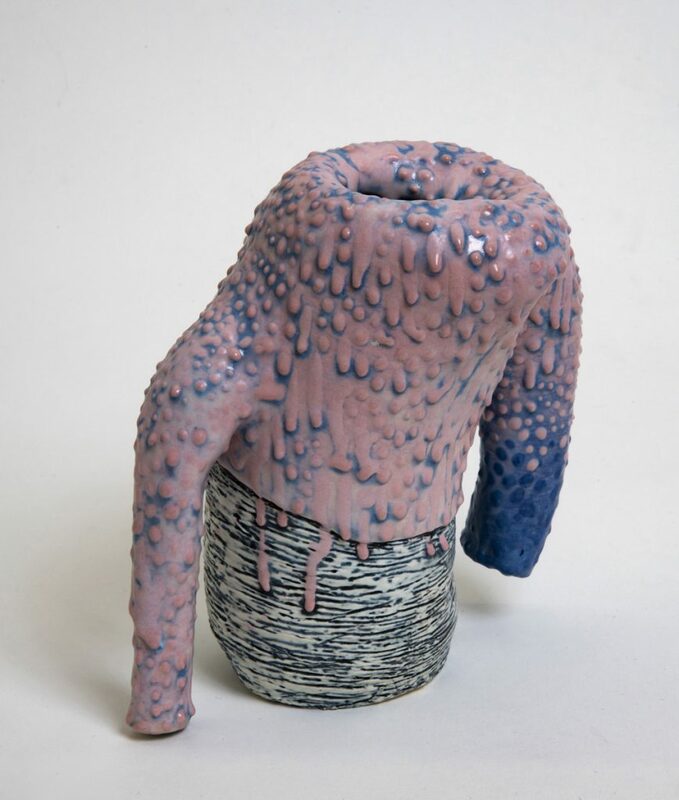 My growing impulse to introduce humor and more fluid gesture was uniquely compatible with clay’s immediacy so in 2010, I began working with ceramics once again. AS: Your textures are both glamorous and visceral, alluring and at times disorienting, elegant and absurd. Do you have in mind this kind of duality? Elisa D’Arrigo: Thank you for that tantalizing description. Yes, definitely – having a kind of duality in mind is essential, although I haven’t conceptualized it. I do it intuitively. It’s an aspect of my aesthetic. I’ve always been attracted to an ugly kind of beauty, although both those terms are highly subjective. As a child, the first art book I ever purchased was on Hieronymous Bosch. I remember being disturbed yet fascinated by the hybrid figures he invented. Employing duality can result in surprising and unexpected images. They’re harder to get one’s mind around – repeated viewing and pondering is needed. As in life, everything has various, often contradictory aspects. What I’m going for is an alive, active surface that both enhances yet transforms the object. With the ceramics, the forms are made relatively quickly, but the glazing (which imparts some but not all aspects of texture/surface) often takes months. I don’t really know what I want, but I know what I like; When I see it, that is. I do many glaze tests, with varying surfaces, textures, and colors. That said, there is usually a moment with each work where I consider the tests, think about what I’ve done before, and move on to something untried, treating the piece as a test tile. I use multiple firings to deal with the often disappointing consequences of my impulse move, hoping to arrive at a result that seems to do what the form wants to be. I am endlessly challenged, humbled and fascinated by how texture, surface and color can transform and alter three-dimensional form. AS: In the statement on your web you say that your work “contains a range of allusions to the body, nature, and personal memory.” Can you tell me more about that? 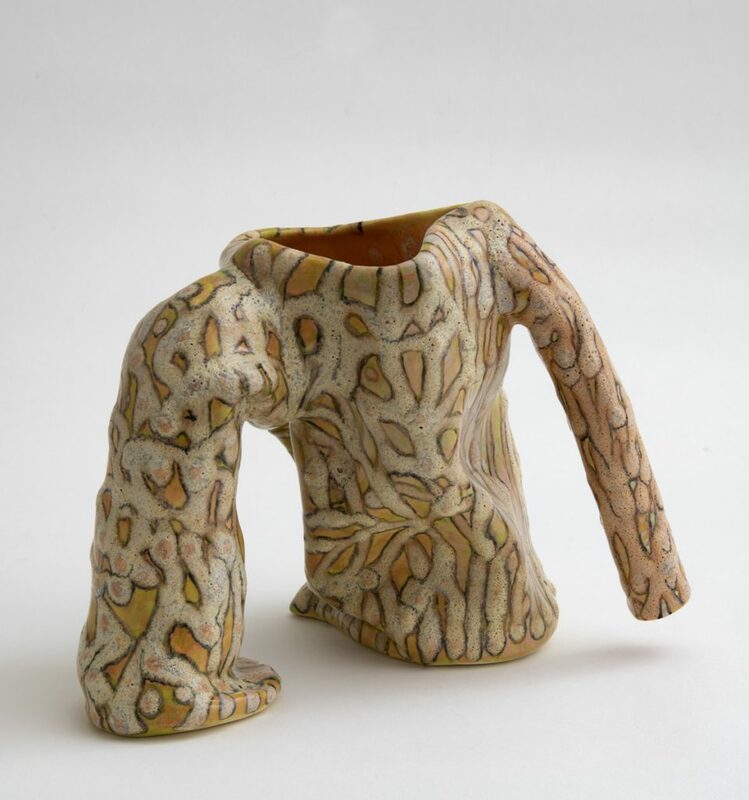 Elisa D’Arrigo: Although I wrote that specifically about the sewn pieces, much of the work I’ve done has all those references embedded: my sewn works seek to recollect and literally piece together a color memory; the ceramics configure a visceral sense of the body from the inside out – conjuring it with gesture and position; there is an evocation of nature’s incremental processes in the creation of form; and a penchant for blobby shapes, derived from my early fascination with the shape-shifting amoebae. AS: It seems that process is central in your work. Stephen Westfall wrote in his essay for your 2007 exhibition at Elizabeth Harris Gallery that you “desire for extendibility- the sense that any given work could continue the gesture of its making, that the composition could extend indefinitely into space, that the light might continue and spread.” I like his ideas of light and extendibility. Can you elaborate on that? Elisa D’Arrigo: I love that sentence. Stephen’s essay was written for a show of cloth and paper works that were hand-stitched together. The process was incremental, small units sewn into larger structures. My fantasy was that I could work on any one piece forever, and keep it growing to fill all the available space. The works therefore have a fragmentary aspect, as if they are part of an ever-evolving formation. One views them as if they are momentarily paused in an ongoing process. I hoped the viewer could imagine them continuing in space, the way one can anticipate the movement of a wave. Another reference was the additive processes in nature – some of which can continue indefinitely, such as the accumulation of sedimentary layers or the slow growth of crystals. In terms of light – I thought perhaps Stephen was speaking about the work’s inner illumination, but not sure about that. AS: Let’s take “PG on My Mind (2).” How did it start, what was your thought and work process there? Elisa D’Arrigo: It is an individual piece in a series of works with similar configurations of form. While making “P.G. On My Mind 2”, I found myself adding an elongated appendage to balance the primary form, to prevent it from falling over. The supporting element became dominant, like the tail wagging the dog. This caused me to recall and muse upon the anatomical transformations and exaggerations in Philip Guston’s “Poor Richard” series. It is also, somehow, a personal homage to a close family member who had a “schnozz,” and wore it very well. 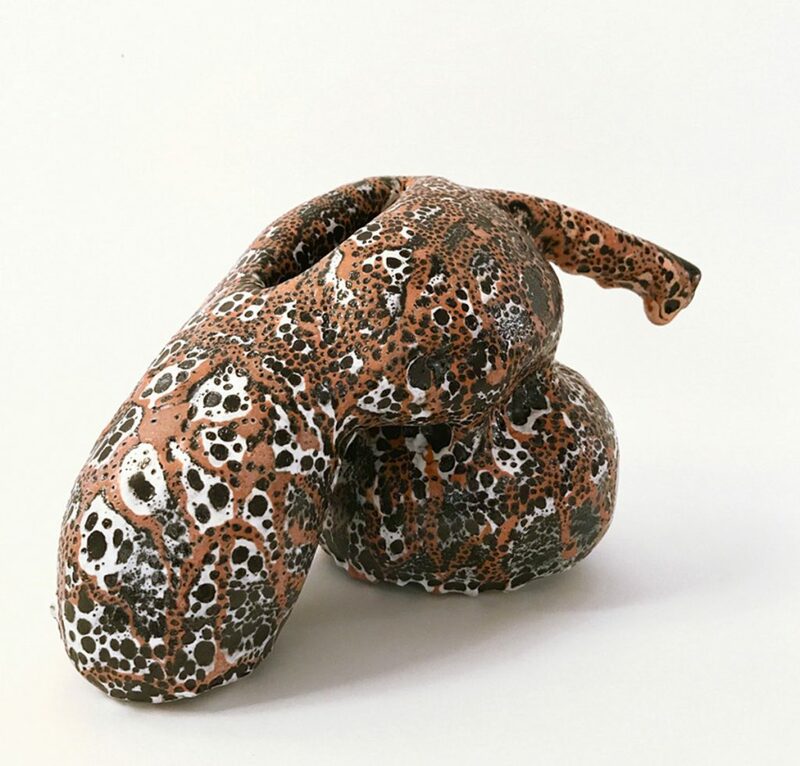 Elisa D’Arrigo: “Pink Sheath” began similarly to “P.G. On My Mind”, in that I arrived at the piece by improvising with an array of hollow cylindrical forms I hand-build from clay slabs – basic forms that I think of as building blocks. My improv working process is like a dialogue with the piece, a dialogue with myself. The unconscious always figures in, reverie occurs. Often images, thoughts, realizations or memories come up that are very personal and unexpected, and then attach to the crystallization of the work. Making work is like an excavation and a discovery at the same time – and I relish that. I am looking for something from the piece that I can both recognize yet be surprised by or even uncomfortable with. Maybe that is a metaphor for the self. With “Pink Sheath” some of the “in the moment” decisions were to dribble color using colored slip, and spill it over onto a rougher white and black cylindrical area that I’d scratched through, creating contrast. I had no question that the colored slip had to be a pink that one might almost find in a flower or things associated with childhood – like bubble gum. A figural aspect emerged with the differently sized, bilateral appendages. They hang down rather uselessly and neither touch ground. There’s not much they can do. AS: Tell me about your scale. It seems like you prefer to work in small scale. How do you choose your scale? Elisa D’Arrigo: I think the scale in fact chooses me. 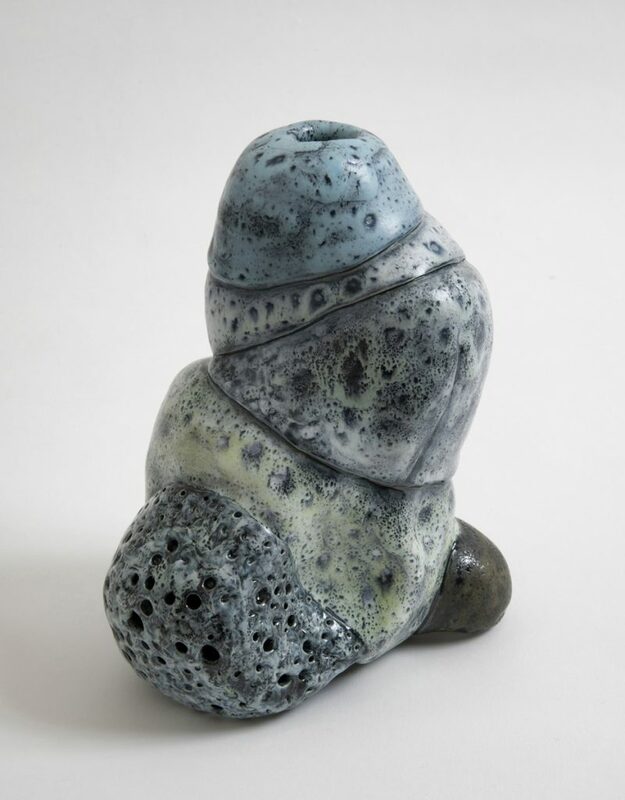 I work in a communal ceramic studio, and my personal space there is about 5 x 7, so quite small – it would be challenging to work large there as it is, especially since much of the space is taken up with containers of glaze. But given that, whenever I do start out on a somewhat larger scale, in the evolution of the piece it invariably gets chopped down, parts get subtracted, squished – the piece seems to find its own, usually much smaller scale. With the sewn works the tendency was the reverse. Since they were created by an accretive process, I could go on adding indefinitely and usually deferred finishing a piece – adjusting and adding to the edges became a major preoccupation with those works, and some would get quite large. AS: We were talking about earlier and current works. How do you think your work has evolved? Elisa D’Arrigo: My work has evolved in a circular manner. There has been an ongoing re-working, re-visiting and re-imagining of forms and processes. I am using clay now, after a hiatus of nearly 30 years, because I felt there was unfinished business with that material and what it elicited from me. The other day I found a drawing from 1990 that was an almost exact description of a ceramic piece I made last year. I’m frequently surprised at finding these connections. Although processes and materials have varied over the years, there’s a recurrence of concerns and images, such as references to the body, nature, and the expression of states of mind through form, all interwoven with memory.